VISIONS OF THE SPIRIT - INVITATION . . . . . The outer band of the painting depicts Dragon, Phoenix, Unicorn, and Tortoise, the four divine creatures in Chinese Mythology. Dragon is a symbol of loyalty, eternity, Emperor, courage and strength. He has the power to control rain, and rules the springs, rivers, and the sea. Presiding over the Eastern Quadrant, he rebukes against greed, and has the power to mediate between Heaven and Earth. The sight of a dragon is considered a blessing and means Heaven is letting the people know the Emperor is doing good deeds. 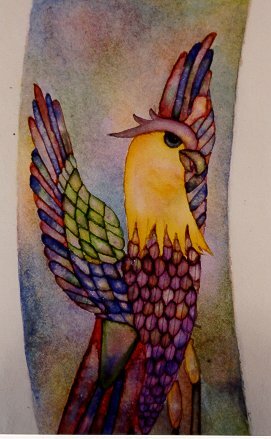 Phoenix symbolizes feminine beauty, Empress, goodness, warmth, prosperity, and peace. She also represents the Sun, abundant harvests, reason in government, and is the ruler of the Southern Quadrant. Unicorn, representing the Central direction, is said to have a scaly body comprised of a horse and a lion. With hairy legs and cloven hoofs, it is a well-mannered and benevolent creature which radiates perfect goodwill and gentleness. Tortoise symbolizes longevity, strength, and endurance. The messenger to the human race, he also represents and guards the North direction. 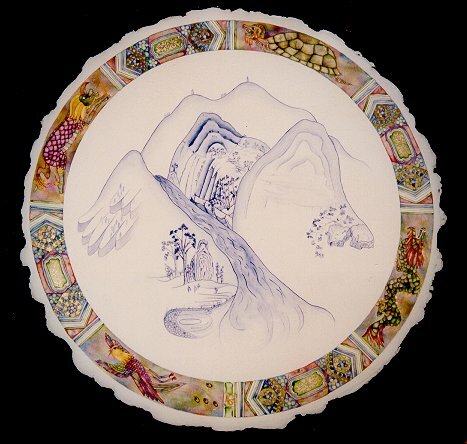 The mountain scene in the center is inspired by what I saw while riding the train to Jingdezhen, where blue-on-white porcelain was first developed exactly 1000 years ago. Hidden in the design are suggestions of the four mythical animals. The top of the mountain range is the dragon's back, and since he has dominion over the seas, the water comes down through the mountain and ends in his claw. The center mountain is the tortoise-back. He is the intermediary between humans and the spirit world. The mountain on the right has qualities of the unicorn. His cloven feet can be seen in the rocks below. Finally, the mountain on the left has qualities of the phoenix, which represents beauty, hence the garden with trees, rocks and water - the three things said to be necessary for a beautiful Chinese garden. The pool at the bottom is made from the peacock's feather. 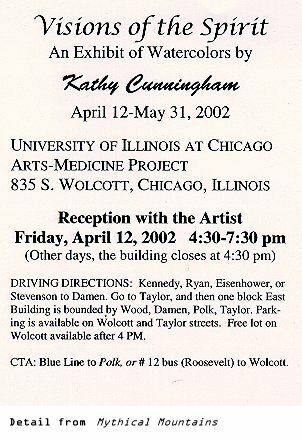 other recent paintings by Kathy Cunningham, will be on display during this exhibit. to understand the dangers of work in the arts and discover practical solutions. motions involved in many art activities can lead to various disorders. be made available to individuals without insurance or other means of payment.